This book re-examines one of the most intense controversies of the Holocaust: the role of Rezs Kasztner in facilitating the murder of most of Nazi-occupied Hungary's Jews in 1944. Because he was acting head of the Jewish rescue operation in Hungary, some have hailed him as a saviour. Others have charged that he collaborated with the Nazis in the deportations to Auschwitz. What is indisputable is that Adolf Eichmann agreed to spare a special group of 1,684 Jews, who included some of Kasztner's relatives and friends, while nearly 500,000 Hungarian Jews were sent to their deaths. Why were so many lives lost? After World War II, many Holocaust survivors condemned Kasztner for complicity in the deportation of Hungarian Jews. It was alleged that, as a condition of saving a small number of Jewish leaders and select others, he deceived ordinary Jews into boarding the trains to Auschwitz. The ultimate question is whether Kastztner was a Nazi collaborator, as branded by Ben Hecht in his 1961 book Perfidy, or a hero, as Anna Porter argued in her 2009 book Kasztner's Train. Opinion remains divided. 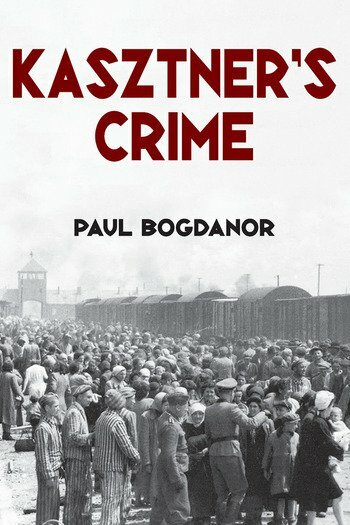 Paul Bogdanor makes an original, compelling case that Kasztner helped the Nazis keep order in Hungary's ghettos before the Jews were sent to Auschwitz, and sent Nazi disinformation to his Jewish contacts in the free world. Drawing on unpublished documents, and making extensive use of the transcripts of the Kasztner and Eichmann trials in Israel, Kasztner's Crime is a chilling account of one man's descent into evil during the genocide of his own people.